Perennials have long been used in carefully thought-out flower gardens that provide beauty, fragrance, and flowers for cutting from spring until late fall, and even dried flowers for the winter. 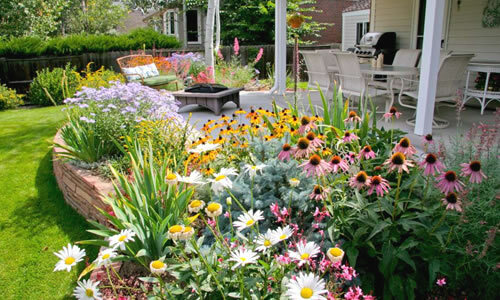 Before planting a perennial garden, you might first want to decide on a type or theme to your garden. You can plant a garden specifically for attracting butterflies and/or hummingbirds, a perennial shade garden in a shady spot, a cut flower garden so you can have plenty of fresh cut flowers to enjoy in indoor flower arrangements, a Xeriscape garden for a site that stays dry and might be difficult to provide irrigation, a bog garden to turn a wet area into a beautiful asset, and the list goes on. In addition to grouping perennials together in various types of theme gardens, many perennial plants are equally as useful planted as focal points, accents, in small groupings or in mass in landscape beds and islands. Too, many perennials are great performers in container gardens that can be placed on porches, patios, near the swimming pool and other outdoor living areas where they can be enjoyed. When selecting perennial plants, keep in mind that it's important to know the cultural needs - soil, sun, nutritional needs, etc - of each specific variety of plant. For example, if you're planting a butterfly garden in an area that tends to stay dry you'll want to select butterfly attracting perennial plants that are also drought tolerant. Before planting your perennial garden it's wise to do a little planning. As already mentioned, you want to select plants with cultural requirements that match the planting area. Then make a list of the perennial plants you'd like to plant and record basic information as to size, light requirements, soil preference, and hardiness in your zone. Next, draw out at least a simple sketch of the garden; its size and shape. In the sketch, indicate where certain types of plants will be located in the garden. If you can draw it to scale that's even better. Before you can begin soil preparation and planting you must have plants! When searching for perennial plants you most likely will not find every kind you want at one nursery. Here in Wilson Bros Gardens, you won't find thousands of varieties of perennial plants, but what you will find is some of our favorites...the types and varieties of perennial plants that have performed best in our own gardens since the early 80's. Local nursery and garden centers are another great place to find perennials. Outline the garden. If you will grouping various perennial plants together in a garden use marker paint, flour, or a garden hose to outline the shape of your perennial garden on the ground. Remove weeds. Either dig, hand-pull or spray weeds with an herbicide listed for use in garden beds. Glyphostae-based weed killers such as Killzall are safe for use. Make sure to read and follow instructions on the product label before use. If you choose to kill weeds with a glyphosate-based weed killer, wait at least two hours or until weed killer is completely dry before planting. Add organic matter to soil. If the soil in your garden bed is heavy, dense clay or poor, amending it with composted organic matter can be beneficial. To amend the soil, simply disperse a 1 to 2 inch layer of compost, such as mushroom compost, composted manures, or your own home made compost, over the garden area. Till or turn amendments in to a depth of 6 inches or so. No need to add fertilizer. After tilling rake smooth. You are almost ready to begin planting. Note: It's okay not to till or turn the soil in your perennial garden. You can add amendments later when planting plants individually in undisturbed soil. Placing the plants. Set all of your perennial plants out in your garden, making sure to space properly to allow for future growth, and to allow space for plants you couldn't find right away but intend to plant later. Use marker paint to draw circles in the garden that indicate the width of missing perennials that will be planted later. Digging the planting holes. If the garden bed was tilled you can dig a planting hole the same size as the root ball of a plant. If you did not till the soil, dig the planting hole 2 to 3 times the width and a few inches deeper than the root ball of the plant, or at least 12 inches wide. The wider the planting hole the better. TIP: To remove a plant from the container it was growing in, grasp the plant by its base and try to very gently lift and remove the root ball from the container. If the root ball is stuck in the pot either cut the container away or place the plant on it's side and gently pound on the side of the container to loosen the root ball. After having removed your plant from its container, loosen some feeder roots around the surface of the root ball. Some perennial plants are notorious for becoming root bound in containers. If root bound, you can spray the sides and bottom of the root ball with a stream of water from a garden hose. This will help to wash away some soil from the exterior of the root ball making it easier to loosen roots. Now you are ready to plant. Set plant in hole and backfill around root ball, making sure that the top edge of the rootball is at ground level or slightly above to allow for settling. Tamp soil mixture lightly as you back fill to remove any air pockets. Water in. After planting all of your perennials in the garden, give them a good deep soaking, and then on an as-needed basis until established. It's important to know the water needs of each specific variety of plant in your garden. Some perennials, such as Sedums and other succulents, prefer life on the dry side, so be careful not to over-water them. Other perennial plants, such as Canna lilies, like more moisture. Mulching. To help retain moisture and prevent weed growth you can apply a 1 to 2 inch layer of aged wood mulch, pine straw, or compost. As mulch decomposes over time it will add beneficial nutrients to the soil that your plants will appreciate. TIP: If you will be growing flower bulbs or allowing flowering perennials to self-sow from seed, DO NOT apply a weed preventer. Otherwise, if you're growing sterile hybrid oplants that don;t produce seeds, and you don;t intend on planting any flower bulbs, you can apply a weed preventer.